Fast forward 4 years. Today is Robbie's First Communion. 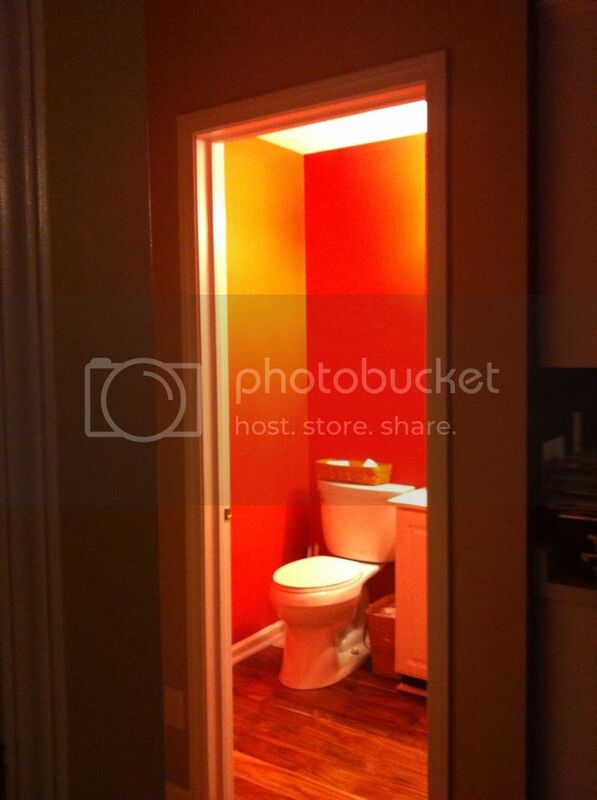 The bathroom is no longer yellow. But it is still glowing.I was smart enough to hire someone else to paint it. I should have let him pick the color, too. I think I might frame this picture. I'll call it: "When it's your time to go, move toward the light." After spending two plus days at the Erma Bombeck Writers Workshop, you can imagine the pressure I felt to come back and post something funny. I thought about it the whole way home. I even half-hoped my family would provide some fodder when I walked in the door. I was so deep in thought that I barely heard, then subsequently ignored, the low fwap-fwap-fwap sound coming from somewhere behind me as I neared the end of the drive. My hopes for humor-inducing minor catastrophe were dashed when I walked in to a pretty picked up looking house. Shoot. Twenty minutes later, I was out the door again, on my way to the gas station/theatre class/soccer game/church. If there was a fwap-fwap-fwap going on, I didn't hear it. But as we pulled on to the highway, there was a very loud POPSLAP! "What was that?" Annie asked. "I don't know." I shook my head and kept driving. There was no more fwap-fwap-fwap. But there was a loud and getting louder gruuuuund-gruuuuuund-gruuuuuuund. I looked around for some beater of a car driving by that could be making that ruckus. No luck. 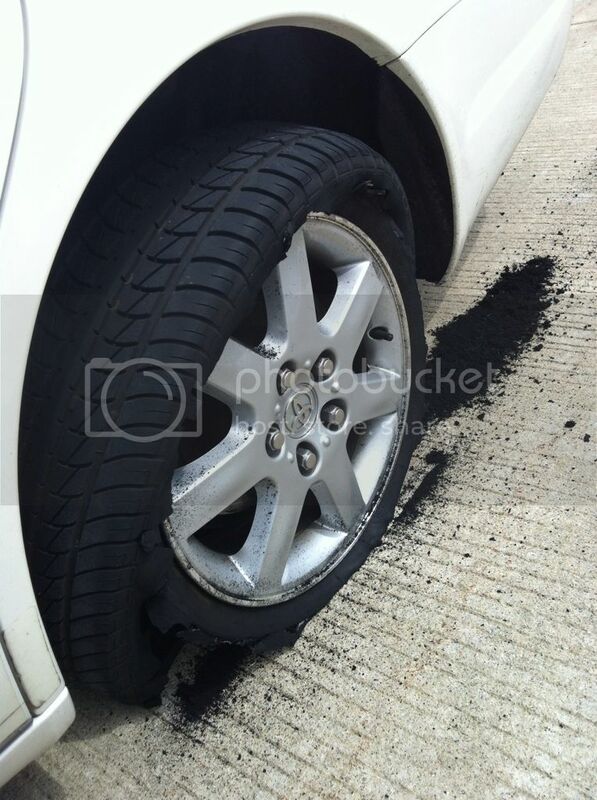 By this time it was clear that I -- or at least my car -- was the source of the ruckus. I didn't really want to pull over on the side of the highway, so I put my flashers on and slowly drove to the nearest exit, just around the bend. That's when I noticed the bluish-black smoke and started to smell something burning. Had I lost my tailpipe? Was the radiator dragging? Was the engine on fire? Now off the highway, I pulled over to the side of the road, turned off the car and braced myself for what I might find. That bluish-black smoke? Does "burn rubber" mean anything to you? Oh yes, ladies and gentlemen, fwap-fwap-fwap, POPSLAP and gruuuuund-gruuuuuund-gruuuuuund are the sounds of a leaking, exploding, and finally shredding tire. I am happy to report that I did NOT cry. I did what any other blogger/recent attendee of the Erma Bombeck Writers Workshop would do. I raised my eyes to the heavens, laughed at the knowledge that Erma was putting me to the test, and started taking pictures. After I was finished taking pictures, it was time to find the spare tire. I was pretty sure it was in the trunk -- under my luggage from the conference, my CPAP machine, the earth-friendly grocery bags, the extra fabric from Annie's $100 uniform skirt, the pair of shoes I meant to take back to Old Navy last fall, two Christmas gifts I knew I bought but couldn't find in December, three blankets in case we ever got stranded on the side of the road in the wintertime, and the body of Jimmy Hoffa. Just after I moved all that stuff to the inside of the car and before I could figure out if our AAA membership is still active, a big maroon truck pulled up behind me and a guy asked if I needed help. After quickly reasoning that he wouldn't kill me in front of my children, I said sure. Ten minutes and some small talk as I waved oncoming cars to the other lane later, I was on my way. Thanks to Darrell of the big maroon truck for coming to my rescue. And thanks to Erma for helping me laugh about it. Make detailed schedule of who needs to be where when over the days while you'll be gone. Email schedule so there will be an electronic record of it in case the printed copy gets misplaced. Make carpool arrangements for kids to get to and from activities. Purchase and wrap birthday present for the party that your family will be going to. Help kid finish school project due while you'll be gone. Plan dinner menu and leave it for the family so they won't starve or just eat junk. Pre-make casserole to be cooked on the first night. Do laundry to make sure everyone has clean underwear, uniforms, etc. Kiss everyone goodbye and leave. Throw some clothes in a bag. But I'm going to aspire to be more like her over the next few days. I'm headed to the Erma Bombeck Writer's Workshop at the University of Dayton. I'm excited and terrified. Usually when I go to conferences, I worry about what to wear, if I'll fit in with the other attendees, if there will be ample supply of Diet Coke. But this one is different. Can you imagine, 300+ humor writers in one place? I have visions of people standing around one-upping each other with punch lines and witty retorts. Which of course leads to the "what if I'm not funny" anxiety. Just to be sure, I've got my go-to stories -- you know, the ones that always get the laughs -- ready to use if necessary. Honestly, what will they do if I'm not funny enough? Kick me out? As far as I can tell, there is no island vote to banish the unfunniest person. And out of 300 people, certainly there will be one or two people who might appreciate my brand of humor. Ah...my brand. Several of the sessions are about developing your brand. Does the 4th Frog have a brand? If disorganized, stress-eating, overweight and desperately wants to be loved makes a brand, then yes, I guess so. I'm planning to attend some sessions on keeping the creative juices flowing, so stick around. This blog could get GOOD. And there's a stand up comedy boot camp followed by a chance to perform at the closing dinner on Saturday night. Since I don't know anyone who'll be there, I'm thinking about giving it a try. There's room for more fat & funny women in America, right? I don't promise to come back another Erma Bombeck. But who knows? Erma probably didn't expect to end up hanging on refrigerators all over America. I went to lunch with several co-workers today. We decided to skip our usual neighborhood places and head downtown to Scotty's Brewhouse. I love the Brewhouse -- even when I'm not having brew, which is most of the time. Fried pickles. YUM. Great lo-cal options. Even better "regular options." Today, I ordered the half buffalo chicken wrap with carrots and celery on the side. The wrap came with the mild mo'fo sauce. I can't imagine what the hawt mo'fo sauce must be like, because my mouth was feeling pretty fiery after the first two bites. (I think I drank a whole pitcher of water by myself.) Please understand, this wrap was GOOD, but spicy. So as the table next to us was wrapping up, the server brought their checks and the traditional box of Red Hots for each Scotty's customer. Red Hots did not seem to be a great follow-up to my spicy lunch, so I got to thinking that Lemonheads would be a great after-meal treat. I move that @brewhouse switches from Redhots to Lemonheads. Anyone second the motion? @BgKahuna @kristina64 @sssemester? Here's where the schmuckishness comes in. Before I got back to my office, I had a direct message from @brewhouse -- Scotty Wise, THE Scotty in Scotty's Brewhouse. Red hots are there to memorialize my grandmother (passed away many years ago) as she put them in my applesauce to get me to eat it, so they won't be leaving anytime soon...sorry. Please Scotty, you have to believe that I would never interfere with the memory of anyone's Grandma. Honestly, I'm not that big of a schmuck. At least not on purpose. What's worse is that I've pulled several friends into schmuckdom with me. There are at least five people on Twitter now calling for Scotty to move away from the Red Hots. What have I done?! I hope I haven't gotten myself banned from Scotty's, even if they don't offer Lemonheads. The world's only corn palace is in Mitchell, South Dakota. The biggest Lego set made is the Taj Mahal set, which contains 5,922 bricks. Blue is the most popular Crayola crayon color. On May 9, 1914 President Woodrow Wilson issued a proclamation declaring the first national Mother's Day as a day for American citizens to show the flag in honor of those mothers whose sons had died in war. George Washington never really had wooden teeth. He did have dentures carved of hippopotamus ivory, however. The most popular flavor of Ben & Jerry's ice cream is Cherry Garcia. Elton John's real name is Reginald Kenneth Dwight. Queen Latifah's is Dana Elaine Owens. It takes 850 peanuts to make an 18-ounce jar of peanut butter. Kahuna is Hawaiian for "expert chicken eater." Monks can be credited with inventing champagne, pretzels, the mechanical clock and tennis. Sony's first product was a rice cooker and Nintendo started out as a playing card manufacturer. The fear of frogs is called ranidaphobia. It happens every year at this time. ...only the lowly black jelly beans are in the bottom of the basket, left to sit and harden over a year's time until they are tossed when the Easter baskets are pulled out of storage again. That's if they are lucky. 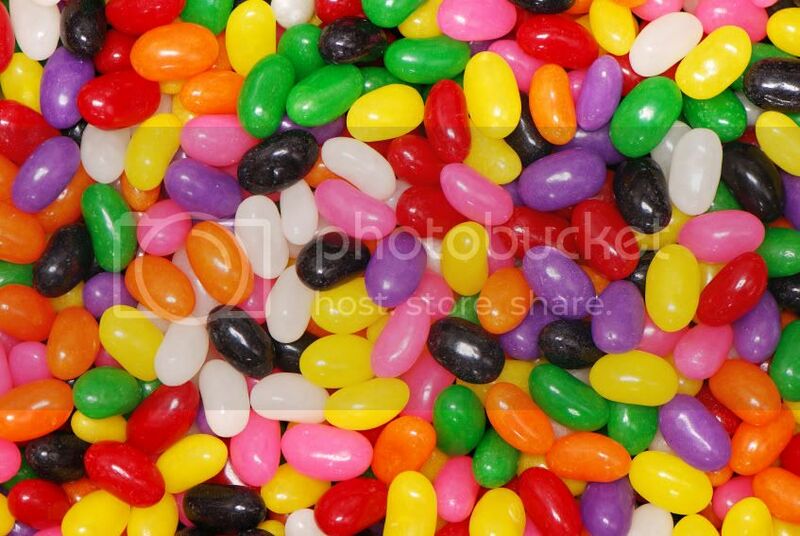 The really unlucky black jelly beans are ridiculed and publicly humiliated. "Ewww! I hate black jelly beans!" I, for one, can no longer sit idly by, watching abuse heaped upon these poor stepchildren of the confectionary world. So I'm doing something about it. I hereby announce the opening of the Black Jelly Bean Rescue Society (BJBRS - pronounced "bee-jee-bers). My Easter basket is open as a repository for all the unwanted, unloved, black licorice-flavored pellets. The mission of BJBRS is to help these delicious bits of Easter candy realize their true potential: to bring mouth-watering joy to those who will consume them. Each black jelly bean surrendered to BJBRS will be stroked and complimented and loved. "Look at you and your beautiful, shiny black coat." "Well, don't you just smell delicious this morning." And upon eating, "Mmmmmm! You taste sooooo good! I love you." I promise a well-loved and dignified fate for every black jelly bean entrusted to me. No questions will be asked of those who surrender their black jelly beans to BJBRS. I would rather you give them a loving end than cast them off to the bottom of the waste basket or damage their delicate psyches with hurtful words. Please package them carefully in sandwich baggies, so as to avoid losing any to random sidewalks or sentencing them to a life under the front seat of the car. Should you have entire pre-packaged bags of black jelly beans (and if you hate them so, I can only believe you purchased them with evil in mind), please let me know in advance so I can be sure to have enough black jelly bean-loving foster homes prepared to accept them. Together, we can end the humiliation and hatred against the gelee haricot de noir -- the black jelly bean. Hello friends! It's Good Friday and despite the sadness and solemnity of the day, it does indeed feel good. Last night was my favorite Mass of the year, Holy Thursday. The church was full and so many of the people I love were there. Charlie was an altar server. I was so proud to watch him serving and taking part in the extra rituals of Holy Thursday. Annie volunteered to strip the sanctuary and the altar at the end of Mass, preparing it for the starkness of Good Friday. And Robbie was so well behaved. It was such a warm experience. After church yesterday, prayers were answered. God is good. That's all I have to say about that. Annie is coming to the end of her Spring Break. Yesterday I took her driving in an empty parking lot. Max speed = 4 miles an hour. I kept trying to get her to go at least 10. I think Mike is going to be her primary driving teacher. But she wants you to know that she did a great job parking. She also applied for her first job. Holy cow, who is this teenager and what did she do with my little girl? Showing a little of my spelling snob here, but I had to snap this at McD's during my morning Diet Coke run yesterday. I'm a week beyond my carpal tunnel surgery and all I can say is what the heck was I waiting for?! This has been so easy.. My hand a little tender sometimes and easily fatigued if it's not wrapped or in a splint. But bring on the next one. My left hand in comparison feels so fat and numb. I don't know if it's worse because I'm using the left hand more to compensate for the right or because the difference between the two is so marked. I'm thinking I'll have the left one done in early May. 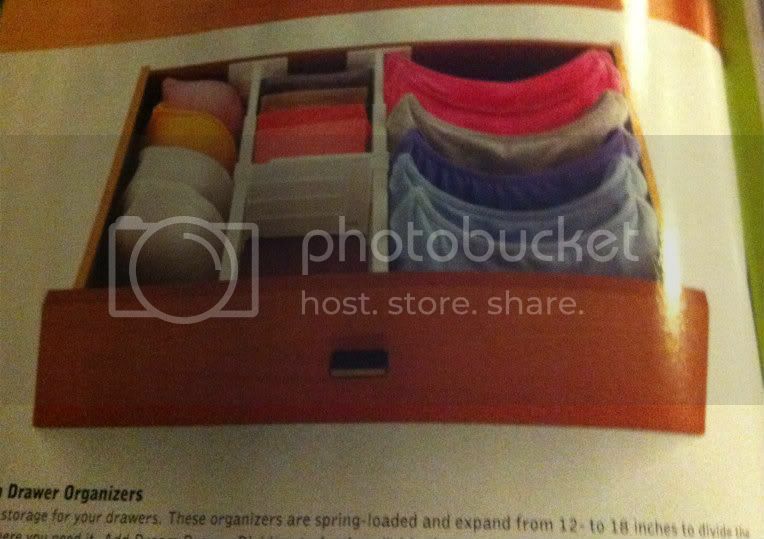 If you store your underwear like this, I'm afraid we can't be friends. Who stands their underwear up? And how do you get it to stay that way? I have it on good authority that the Easter Bunny has Reese's peanut butter eggs ready to drop in our baskets. That, Peeps and black jelly beans will make Easter complete. And oh yeah, the resurrection of Christ. Have a blessed Easter. Now go over to Mrs. 4444s, hostess of Friday Fragments, and wish her the same. The sight of my bandaged hand seems to invite a lot of concerned and curious inquiries as to what happened to me. The answer -- carpal tunnel surgery -- is kind of boring and getting a little monotonous. So I thought maybe I should come up with some answers that are a little more colorful and interesting. See how these grab you. Someone tried to take the last Diet Coke, so I punched him. We were at the zoo and I got too close to the tiger cage just before feeding time. I'm wrapping my hand right hand in solidarity with the lefties of the world. I was high-fiving Robbie. The kid doesn't know his own strength. My kids aren't buying "Mommy's legs are broken" anymore. It's an old Facebook injury. It's a new diet technique. Everything I put on the fork or spoon falls off. Oh nothing. I just like the attention. Do you have any others that I should add to my repertoire?